[CH]OLBON, the daughter of the Devil is a beautiful girl ... she is the bride and the sweetheart of Satan's son ÜRGEL (Pleiades). When these two stars come close to one another, it is a bad omen; their eager quivering, their discontinuous panting cause great disasters: storms, blizzards, gales. When they unite, fathom deep snow will fall even in the summer, and all living beings, men, animals and trees will perish . . . The Yakuts have two words for the "star": SULUS and [CH]OLBON. The first means simply "star", the second refers to stars that change their place in the sky, sometimes appearing and disappearing. Nowadays, however, it no longer--or very seldom--refers to other planets than Venus and has almost become its name. Yet, as we have seen, in legends also other [CH]OLBONS (i.e. planets) are mentioned. What is remarkable about these particular tales is the conjunction of several pieces of information. From these lines we gather that a comet ([CH]OLBON with a tail) came close enough to influence weather on Earth--i.e. deadly storms, frost and deep snow in summer. Also, we are told that this is most likely to occur if the comet appears close to the Pleiades. In short, these legends accurately describe what can now be inferred from astronomical data on comet Encke and the ring of debris its progenitor strew about the Sun. As the above example suggests, contemporary researchers need to be wary of assuming our predecessors' folk memories of astral events relate to bodies familiar to our time. There is considerable reason to suspect that the majority of the planets namesakes were comets--probably of the Encke family. The Epinomis, which dates from around the 4th century BCE, is the earliest extant record of Greek planet names; each is given as "the star of": Cronos, Zeus, Aphrodite, etc. Clearly the planets did not inspire the earlier stories which championed these gods. The mythology associated with these names certainly better describes the break-up of a comet with an orbit that crossed Earth's path than the monotonous behavior of planets. There are many more references to BIBBU, but in them the translations "unspecified planet" or "meteor" could be proposed. With astronomical evidence in mind a simplified, but testable, hypothesis of Bronze Age collapse would involve accepting the legend of Phaethon as an event inspired myth, as Plato contended it was, and also giving credence to stories of protracted winter in the aftermath of celestial "battles," such as the Ragnarok. During a close approach to a massive object like our planet a comet would be gravitationally disrupted (Phaethon's disentegrating chariot) independent fragments would then further break to pieces as they entered Earth's atmosphere. This debris, of various shapes and sizes, would scatter widely along the path of the fall, each piece harboring energy in proportion to its mass. The "footprint" of this event could have included some of: southern Europe, the Mediterranean, the Near East, and Northern Africa. Damage, however, would not be uniform throughout this area. If the disintegrating objects were traveling south of east, as the Phaethon story implies, the more massive fragments would travel farther and release their greater energy, explosively, lower in the atmosphere toward the southeast end of the elliptical area directly affected by the fall. In other words, the Near East would be more heavily damaged than southern Europe. A survey scaling intensity of site destruction might reflect this aspect, i.e., vitrification of soil and building materials might occur below lower altitude multi-megaton blasts. Many astronomers believe the 1908 Tunguska impact was from a small piece of Comet Encke. This 15 to 30 megaton event leveled 2000 sq km of dense Siberian forest, but left no crater. Certainly there have been many damaging falls witnessed by people during the 15,000, or more, year period of the comet's fragmentation history. The terminal Bronze Age event was probably just one of several very energetic impacts which likely occurred in this time span. The association of disaster (etymologically, dis - evil; aster - star) with comets eventually became generalized beyond direct causal links, giving science oriented investigators reason to classify this ubiquitous notion as mere superstition. Scientific efforts to understand the past were thus rendered purblind to a highly influential natural phenomenon. Important in understanding ancient oriental lore is learning that this motif was associated with the pheasant (divine bird in China) which is frequently mentioned in the Chinese classics. The link between the spinning cross and birds is evident on artifacts from many cultures. Perhaps the association of the Sanskrit term "svastika" with this symbol can be linked to the Astika Parva in the MAHABHARATA which relates the birth of a cosmic bird par excellence--Garuda. This fabulous winged deity had a radiance like the Sun, could change shapes at will, and destroyed other gods and kings by casting down fire and stirring up storms of reddish dust which darkened the Sun, Moon and stars. Clearly Garuda was symbolic of an Earth approaching comet.
. . . in course of the same month both the Moon and the Sun have undergone eclipses on the thirteenth days from the day of the first lunation. The Sun and the Moon therefore, by undergoing eclipses on unusual days, will cause a great slaughter of the creatures of the earth. Meteors, effulgent like Indra's thunder-bolt, fall with loud hisses . . . People, for meeting together, coming out of their houses with lighted brands, have still to encounter a thick gloom all round . . . From the mountains of Kailasa and Mandara and Himavat thousands of explosions are heard and thousands of summits are tumbling down . . . Fierce winds charged with pointed pebbles are blowing, crushing mighty trees. In villages and towns trees, ordinary and sacred, are falling down, crushed by mighty winds and struck by lightning. Owls, like cuckoos, have zygodactylous or semizygodactylous (outer toe reversible) feet. Obviously these "Trojans" had an elaborate belief system which focused on the activities of a non-terrestrial bird of the night. With this in mind, a re-examination of artifacts recovered from Hissarlik could be quite revealing. Comets can also change spontaneously; a gas emitting area could become dust covered and extinguish a jet, a piece of the comet could break away, creating another comet, perhaps initially more flamboyant than its parent. Our ancestors' stories speak of these weakening gods and fantastic births; however, until now, our ears heard only gibberish. Another motif which is found around the world is the concentric circle. Astronomers, with the aid of a telescope, have reported, and drawn pictures of, comets which exhibit concentric rings, so it is likely that some of these ancient renderings, often pecked in stone, represent comets. There is, however, probably another phenomenon more often represented by these ancient bull's-eyes--a bolide storm. Fred Whipple, the astronomer who theorized in 1950 the now proven structure of comets, calculates that the night time Taurids have been a feature for 5,000 years. It now takes Earth about three months (mid-September to mid-December) to traverse this band of debris. Earlier in its history, as the progenitor of comet Encke was creating it, this debris ring had to have been more dense. As Earth passed through the mess, it no doubt collected a considerable amount of dust. The night time Taurids are known for frequent bolide activity. Large, vaporizing meteoroids (bolides) in an atmosphere loaded with comet dust will produce unusual visual effects. Refraction, reflection, and possibly secondary emission come into play as a sizable object splashes into an aerosol laden atmosphere compressing molecules of gas against motes of dust in its bow-shock wave until--BOOM -- the object vaporizes, illuminating the multiple layers of compression separated gas and debris. From the ground this might look as if a god threw a pebble in the sky pond. Quite likely a large sector of the sky would be filled with such phenomena. Though the intensity would vary from year to year our ancestors, no doubt, expected a rather disconcerting light show on an annual basis. Tara lies 10 miles southwest of Newgrange and, like Newgrange, it is steeped in ancient myth and tradition. It has always been associated with Samhain, the Celtic observance of the year's turning in November, and this event is well documented. 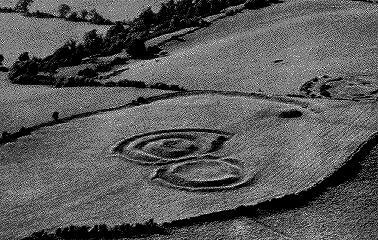 Mythologically, the mound also has associations with the Tuatha De Danann, or the "Lords of Light." They arrive from the air and cast a darkness over the sun for three days. Baillie, M.G.L. & Munro, M.A.R. "Irish tree rings, Santorini and volcanic dust veils." NATURE vol. 332 24 March 1988 (pp. 344-346). Bjorkman, J.K., "Meteor and Meteorites in the Ancient Near East" METEORITICS 1973 vol. 8, (pp. 91-132). Kobres, Bob. "Meteor Defense" WHOLE EARTH REVIEW No. 56 Fall 1987 (pp. 70-73). O'Neil, W.M. TIME AND THE CALENDARS. Sydney Univ. Press, Sydney 1975.